iOS devices, particularly the iPad, are more often used for working on documents with Apple’s iWork suite, storing relevant information in databases, using mind mapping tools for brainstorming, etc. So the data stored by apps should be backed up to prevent data loss. Apple offers two versions of complete device backups, via iTunes and via iCloud. Both backups contain all data of your device and, in case of a device’s malfunctioning, can be used to restore the complete device. Please read again: The complete device. It’s not possible to extract the data of a single app which was deleted before because of an operation error or in case of a necessary re-installation. An exception would be if the app supports iCloud and it’s data are stored there. If the app then is re-installed it might get it’s data back from iCloud. This depends on the app and has to be proven before deleting an app with the help of the developers manual or support. A further exception would be an app supporting cloud access like the mind mapping tool iThoughts. This app supports Dropbox and all the locally managed mind maps should be additionally saved on your Dropbox account to seamlessly get them back if the app was deleted. 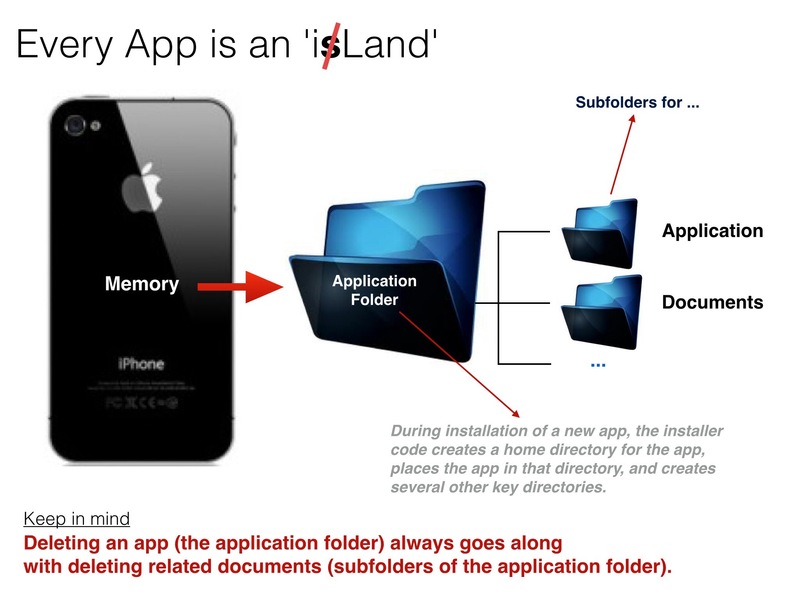 Keep in mind that iOS always stores app specific data in app specific folders which means that the data stored on the device get lost if the app is deleted. 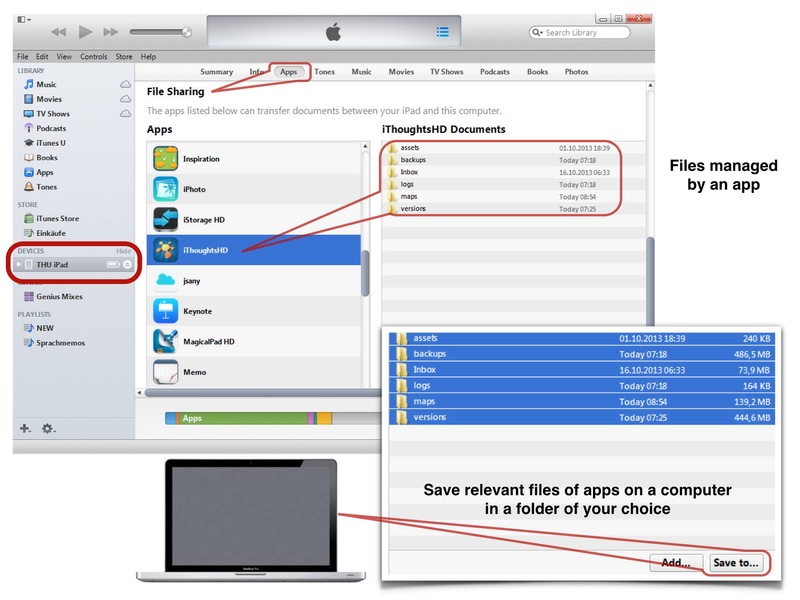 For apps which do not support iCloud or any other cloud storage you have to save data manually by connecting your device to a computer with an installed version of iTunes and save the data from within the File Sharing section of iTunes to your local hard drive. That’s the only way to restore data for this kind of apps. There are some tools available for restoring app specific data as mentioned under ‘Related links’ but these tools are not supported by Apple and so it’s off topic for my blog. It’s always a risk to use such tools. It might work or it might go wrong. So it’s your decision to use them. If you no longer have access to your device because it’s locked or the operating system malfunctions you have to Recover your device. 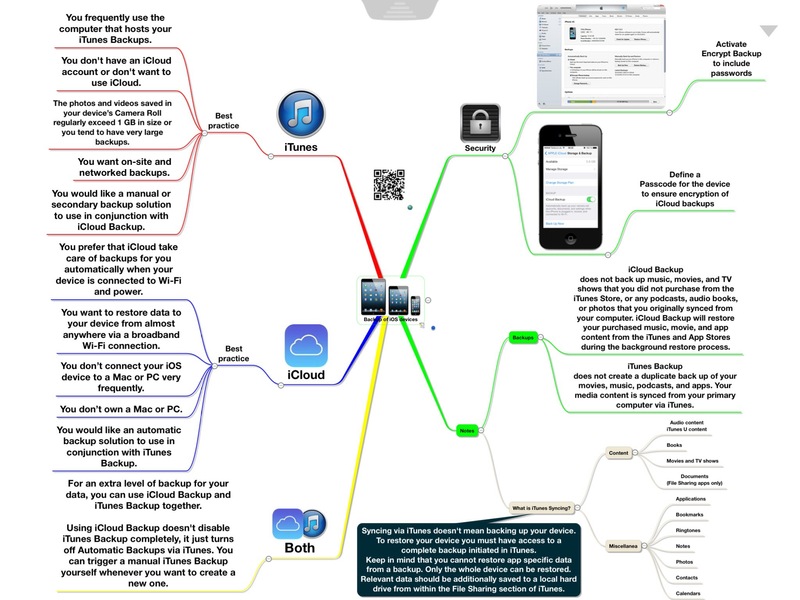 See this mind map to decide whether you should prefer backups via iTunes or iCloud. 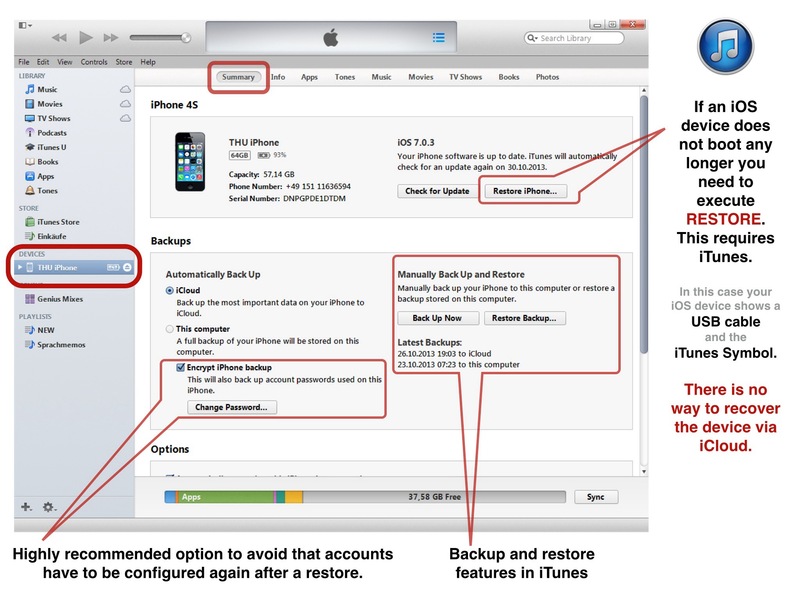 It’s recommended to use both backup procedures if you use your iOS device for creating valuable content. Using a password is highly recommended. If you don’t use it sensitive data like E-Mail account information, saved WiFi access credentials, or iTunes account information are not stored in the backup files. If you encrypt an iOS device backup in iTunes and forget your password, you will not be able to restore and your data will be unrecoverable. The folder where your backup data are stored depends on the computer’s operating system. Make sure the backup folder is included in your periodic backup of your computer. Apple’s backup files are XML files. Any manipulation of the folder’s content may destroy the backup. Better sage than sorry. So an iCloud backup should regularly be completed by an iTunes backup. Sad to say that this is a task which cannot be done if you move into the Post-PC era.